This is a new post that I will be doing towards the end of each month as just a kind of update on a bunch of personal life things rather than splitting them into multiple posts. It will include books I’ve read, crafts I’ve done, and other general stuff that’s been going on with me. This book surprised me as I don’t normally like books that have a romance subplot so tend to stay away from books with female leads because of this but I really enjoyed this book. In fact it’s got quite a few things that I don’t like in a book in it but I still liked it anyway. I got it for cheap as it was on offer but I will probably read the rest of the series too. This is one that I’ve heard a lot about and has been on my radar for a while now. I finally got around to reading it as, again, it was on offer and I wanted to read it before I saw the film. I quite liked it, it felt a bit basic and it’s a pretty short book and while I don’t think it’s anything amazingly special and it didn’t have that much going on, I did enjoy reading it. This is the second book in the Gentleman Bastards series by Lynch, I loved the first. I love the main character. He’s my exact favourite type of main character and I could read a hundred stories based around the same type of character and not get bored. so I’m slightly biased. But this is a great book with lots of twists and turns (and lots of swearing). I also got this book on offer (anyone notice a kindle spending spree happening here?) and enjoyed reading this book but while it was fun and interesting it felt a little juvenile to me. Between the vampires, werewolves, the Fae and all the different types of magical powers I kind of felt like the author was trying to fit all her favourite things from kids stories into one. It turns out alright, it’s a coherent story with good enough characters but I probably won’t be reading the sequels. I haven’t started any new crafts this month although I have looked up many that I want to do. That list gets longer everyday. I’m starting to look up Christmas trinket ideas for friends, but whether I will ever get around to them in amongst all the other things we will have to wait and see. I’ve managed to do lots more on my Hogwarts cross stitch which you can see an update of next week. And I’ve done a couple more squares on a new blanket idea that I’m pretending I’m not doing so I don’t get overwhelmed! Moving house and getting rid of stuff inevitably means buying new things. Oops. This month I’ve bought a wireless mouse that I can use while I’m lying in bed and a new sleeveless hoodie to wear when I’m lying outside. Both were really cheap and from amazon (one of the few shops that delivers here). I’ve also bought a load of wrapping paper in preparation for Christmas and have started looking at buying Christmas presents. I’ve managed to not buy myself anymore yarn…yet. I mentioned the move a couple weeks ago, so I’ll just talk about settling in since then. Everything is slowly coming together, small pieces of furniture are still to arrive (chest of drawers I’m looking at you!) but I’ve settled into a routine now that internet and tv is all sorted. I’ve been out a couple of times to eat, mainly near the start where we didn’t have food or tv to watch the football match! But mostly I’m enjoying just being able to move around the new flat and sit outside if the weather is sunny. That’s my month, I hope you are all having a good one. I thought I would share some gadgets and simple electronics that help me save energy in day to day life. First up and I think the one I use the most would be these Remote Control plugs. They’re a pretty good price for what you get and it means I don’t ever have to get out of bed to turn things on and off. I currently have them connected to my heater, my fan (bloody temperature regulation) and my fairy lights/lamp. It means I can change all these things in the middle of the night too. Wake up cold? Press button to turn heater on. Wake up hot? Press button to turn fan on. The remote works through walls too and they are very easy to set up. You can also get remote control bulbs as well. This was never previously a problem for me as in my old place I had a pulley light switch over my bed so I never had to get up anyway. But now that I have moved it is something I will be looking into. There are quite a few options out there. And some of them can be controlled using your smart phone through an app, either using bluetooth or wifi. Unfortunately my new bedroom has halogen bulbs so more investigation is needed for me. These last two are new for me since I moved as I didn’t have need of them before. But I bought this bluetooth music receiver for my old dock which slots into where my Ipod would have gone and means that I can play music using my Ipod as a remote lying in bed and the music comes from my dock across the room. Fin ally for me, I have also recently bought a wireless mouse. Now this isn’t new by any means, wireless mice and keyboards have been around for ages. But for me, it means that I can play tv and movies on my computer without having to get out of bed to actually use the computer. All of these are pretty inexpensive things (the remote control lighting can get quite expensive if you’re changing everything over to that), but they all make so much difference in saving energy for me. Do you have any other gadgets that you use to prevent you using up energy? It feels like it’s been a while since I’ve done one of these posts so here’s another one for you all. I hope you see something you want to give a go. And if you ever see any crafts online that you think would be perfect for other chronically ill crafters feel free to let me know and I might include it in the next Quick Crafts post. 1. 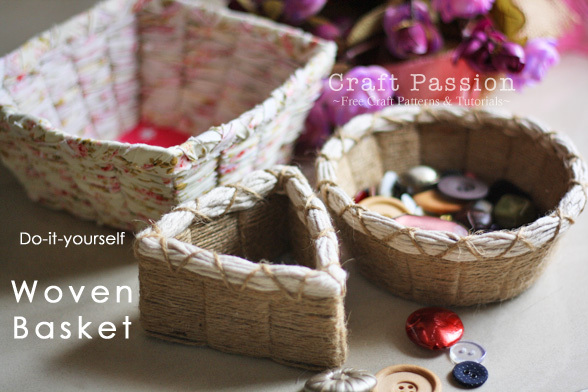 Easy Basket Weaving: This tutorial over on Craft Passion‘s website is a really easy way of being able to create your own woven baskets without the hassle. The basic supplies you’ll need are cardboard, some kind of twine/yarn for the actual weaving and some felt or fabric for the bottom. You can see a full list on the tutorial, which has easy to follow steps with photos as well as a printable template for all three shapes of basket. 2. Ombre Pinecones: I love this idea, especially with Christmas coming up. We always use to have random pinecones lying around in our Christmas decorations and I think these would look brilliant in Christmas colours to add a bit of interest to any room. Be sure to give the pinecones a good clean before you start to make sure the paint stays on. 3. Crayon Candles: These are from Adventures in Making and can be as bright as you like (or maybe try a monochrome one with greys?). The tutorial has all the information you need to change those old unused crayons into lovely candles. You will need a few supplies such as wicks and wax but these should be pretty easy to get at most craft stores. Make sure you check out the comments on the page too as they suggest adding essential oils of your choice to the mixture as otherwise the candles do smell like crayons. 4. Painted Rocks: So you may have noticed no Photograph for this one, this is purely because there are so many amazing ideas for this that I would have to make a whole new post just to show you a selection of them. I don’t want to clog up this post with loads of pictures so I’ll simply link you to a pinterest search which has loads of photos for ideas. The process is get rock, clean rock, use acrylic paint as a base coat (or other primer) then go to town with your design. It’s time to share my progress on my cross stitch project once again. This was where I had gotten to last time I shared, this is actually from 5 weeks ago rather than three as I queued it up early. The move went really well, I made a post about it earlier this week if you wanted to read more about it. This time I’ve made quite a lot of progress, although I missed about two weeks with the move, I ended up without internet for quite a while so I’ve been more productive. I’m also starting to worry about getting it finished as it’s suppose to be a present and the deadline is looming. I feel like I’m nearly finished the crest part which will be step one down and I’m very excited about seeing it finished. It was probably the most fun part of the project and I’m hoping I won’t get bored or bogged down doing the two banners above and below it. I still need to go back and do back stitch around the crest and add the eyes, though I’ve never done the knots before so will have to look that up. You should check out all of the other lovely projects people are doing in the SAL on the links below, we update every three weeks but sometimes not everyone does it every time but you should still check their blogs out. It’s been nearly a month since we moved out of our house and went on the road to get to our new flat. So, I thought I would do a post about it all. I am going to start doing a monthly post called ‘The Memo Pad’ towards the end of each month summing up any events or things that have happened that month, crafts I may have started, books that I have read, things I might have (hopefully not) bought. But I feel like so much has happened with the move this month that I would write about the actual move in its own post then everything since in the Memo Pad in a couple weeks. So first up, removal guys came on a Wednesday morning. They were really great and very quiet as Dad had told them I wasn’t well and was asleep. I didn’t really hear them until about 11am when Dad came in to wake me up anyway as they needed to pack my room! This was what one of the rooms looked like less than a month ago! Packing and sorting 23 years worth of everything was madness. They were finished and gone by 2pm so we had lunch then I shuffled down to the car and we left our old house.We drove down to Poole which was about a 4 hour drive with a stop at service station, and checked into our first hotel near the ferry port ready for our ferry the next morning. We stayed in a premier inn and it was very nice! The restaurant next door served amazing food. I had a lasagna and chips and it was so good that I unfortunately (or fortunately as I’m suppose to be on a bit of a diet) didn’t have room for any of the yummy sounding desserts. My back had pretty much completely seized up by then from having to sit up for a few hours so I went to bed. Next morning, earlier than I would like, we had to get up for the ferry. I skipped breakfast because getting up at half 9 to leave is one thing but getting up at 8 for breakfast is quite another! We drove to the ferry fine as it was only about 10 minutes away. And I had some breakfast on the ship once we were settled. Then went out the back of the ferry onto the open deck to wave goodbye to England. It was a typical drizzly summer day! We arrived in Guernsey after a few hours and drove to the next hotel. We had lunch in the room as luckily they had room service and I was definitely flagging at this point. My parents left after this to pick up our new keys. And I was blissfully unaware of anything until I had to get up for dinner. Again, we went to the restaurant next door to the hotel and had yummy food. The food was posher this time though so I had room for dessert! Brownies and Ice cream. Yum. Then the next morning parents left early to let removal men into our new flat and came back to pick me up from the hotel at check out time. A much more respectable 12pm. And this is the view from our living room. But no rest yet as we had to make our beds. Well, we had to make my bed. My parents slept on their mattress on the floor for the first night! Bless. Here is my finished bed. Remember kids. Pack a hammer next time you move! The last couple weeks we have slowly been unpacking everything and settling in. Still things to be done here and there but I’m loving everything so far! I have another wonderful craft interview to bring you, this time its full of teddies! Thank you to Alison for taking part, and I’m always looking for more chronically ill crafters to feature on my blog so if you would like to take part or know someone who would then please do get in touch. Who are you and what’s you craft? My name is Alison Dunlop and my fb page is Tinted Teddies and I make plush, colourful teddy bears. What illness/es do you have? I have suffered from Myalgic Encephalomyelitis (M.E.) for 20 years. Main symptoms affecting my crafting are severe widespread pain, fatigue of muscles after little use, and general loss of energy after very little effort (and which is not relieved by normal rest or sleep). What are your favourite pieces of craft equipment? I don’t use any major pieces of equipment other than the obvious – needle, thread, scissors, embroidery thread (for noses and for stringing). I prefer very dense, woven backed faux furs as they produce much cuddlier teddies than fun fur. I have a basic pattern, designed by myself, and make changes to it with each bear so that I never make quite the same bear twice. I learn what is possible (or not) with every bear I make. I started getting crafty when I became ill 20 years ago. I’d always had the urge but not the time. At that time I painted portraits – human and animal – and other subjects, and sold at craft fairs. But portraits are the kind of thing that people think hard about before ordering so sales were not massive. Also, I became too ill over time to attend many fairs. I dabbled in jewellery making too. During that time I also developed an interest in collecting teddy bears and, about 2 years ago, I decided to see if I could make a bear myself. I got a ready made pattern to begin with and made a very basic bear. Then I began to imagine how my own pattern would look and started to design my own bears. It’s just a hobby. I do sell via my fb page and word-of-mouth, but I don’t make much profit. I like to sell at reasonably low prices as I prefer people to be able to enjoy my creations rather than sell fewer bears (because of cost) and make more profit. I keep my materials simple and sell at prices that cover my costs, adding about £3 profit. To me, making my bears is a way of doing something worthwhile now I am unable work. It’s like my way of achieving something. And I love to see the pleasure on people’s faces when they receive one of my bears. What adaptations or changes have you had to make to craft because of your illness? I can only sew bears when I’m feeling reasonably well, when my pain is fairly well controlled and when the lack of coordination that comes with M.E. is at a minimum. (Making jewellery proved tricky as my illness got worse as the fiddly jobs became too much for my fingers to handle). It doesn’t take too long for my fingers to become very painful and for me to get a headache from concentrating so bears have to be made in small increments. But I can sit in front of the TV and spread all my bits and pieces around me on the sofa so, once settled, I do okay. Sometimes I get my hubby to put everything away for me (though he has M.E. too so is often no better than me). Often I leave clearing up til next day. Materials have to be bought by mail order as I don’t have the ability to go to the shops for them. I have a favourite teddy almost every time I make a new one! But if I had to choose, it would be a little bunny I made last year and which I liked enough to end up keeping her. I love the colour and her fur is amazingly soft. And I just loved the expression on her little face. I always love my cutest (and saddest) bears best – the ones that cry out for love! Here are a few others I’ve loved including my Viking Teddy, Tattoo Teddy (for a tattoo-loving friend), and Daniel Doorstop who has reinforced legs so that he can stop the door before it bangs against the wall in my bedroom. How expensive is your craft? The fur is the most expensive part of my craft as I hate cheap faux fur. I’ve found a couple of great suppliers of luxury fur but it does cost significantly more – about £15 to make a 12″ bear. Then there are eyes, threads, and stuffing plus any accessories (hats, glasses etc) which I tend to find on the internet. Glass eyes can cost about £7 a pair, but I’ve found some beautiful plastic ‘safety’ eyes on eBay which I prefer as they are not a choking hazard for younger children. Advice for someone with a chronic illness starting off in your craft? If you want to try bear making start with a simple bear pattern (with instructions) – try eBay to find one you like – and a reasonably cheap fur. Once you know you can do it, and like it, buy eyes, noses, threads, stuffing in bulk to save money. You don’t have to design your own patterns, there are plenty to be had out there and, as you go on, you can always tweak them to make them slightly different. Don’t underestimate the time and energy to do this. Do it in small doses til you know what you can handle without harming yourself or exacerbating your condition. Be aware that, by law, bears like this ‘cannot be recommended’ for children under 14 years, as they don’t have the European safety mark (CE Mark). That means that if you are selling them, you need to be careful that people are aware that they are hand-made, have small parts, may not be fire safe etc. They are really collector’s bears rather than play-bears.